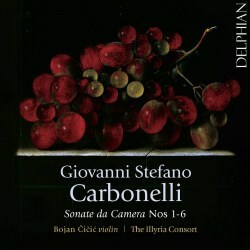 Even if you are particularly interested in violin music from the baroque era there is a good chance that you have never heard of Giovanni Stefano Carbonelli. He does not have an entry in New Grove and four of the six sonatas recorded by Bojan Čičić appear on disc for the very first time. Only recently it was discovered that Carbonelli was born in Livorno, which is some distance away from Rome, and for that reason, as Michael Talbot writes in his liner-notes, it is not likely that he was a pupil of Corelli. However, in the oeuvre of almost any composer of the post-Corelli generation the influence of the Roman master is discernible, and Carbonelli is no exception. His first documented appearances as a violin virtuoso date from 1711 and 1712, when he participated in the annual festival of the Church of the Holy Cross in Lucca. Nothing is known about his whereabouts in the next seven years, until 1719, when the London Daily Courant advertised a performance of a sonata and a concerto by Carbonelli, together with the cellist Filippo Amadei. It seems that in that same year he became the leader of the orchestra of the Drury Lane Theatre, a position he held until 1728. In 1729 he published a set of sonatas for violin and basso continuo, which he dedicated to John Manners, 3rd Duke of Rutland, who was his patron. It is his only extant music, which can largely be explained by the fact that in the 1730s he changed his main profession to that of a wine merchant. He was very successful in that department, and as a result gained in social status and in income. The set of twelve violin sonatas is divided into two halves. The first, which is the subject of the present disc, comprises six sonatas of the sonata da chiesa type, in four movements (except the sixth), with a fugue as the second movement. The sonatas in the other half are in the manner of the sonata da camera. One of the most notable features of these sonatas is their technical complexity. In most movements, and in all of the fugues, Carbonelli makes use of double stopping. In comparison sonatas by other Italian composers were much more moderate in this respect. Undoubtedly these sonatas give us a clue about Carbonelli's own skills on his instrument. The opening movements are often in several sections; the exceptions are the first and the fourth. The second, third and sixth open with tripartite movements: adagio - allegro - adagio. The opening movement of Sonata No. 5 is in five sections: three adagios embrace two allegro sections. Although several movements have dance rhythms, only two closing movements refer to a dance: the giga (Sonatas Nos. 3 and 5). The sixth sonata is comparable with so many last works in cycles of sonatas or concertos. It is different from the other works and is especially brilliant. It opens with a tripartite movement, which is followed by a technically challenging allegro in the form of a fugue. The sonata closes with an aria with increasingly virtuosic variations, with lots of double stopping. However, it is notable that in the last variation a highly virtuosic episode is followed by a more lyrical passage; the latter also closes the sonata. As I already mentioned, only two sonatas have been recorded before. I find that hard to understand. I am very impressed by these pieces, and it is a matter of justice that they are now available on disc. The man, responsible for this recording, Bojan Čičić, deserves our heartfelt thanks as well as our admiration for his interpretation, which is technically brilliant and musically passionate and zestful. I have heard him several times, live as well as on disc, and I was always impressed by his musicianship and his approach to the music. Recently I heard him as a member of the Academy of Ancient Music in sonatas by Dario Castello. I was surprised by the rather tame performances. Here he is on his own and can show what he is made of. His colleagues are his equal partners and follow him every step of the way. Having listened to these sonatas one can only regret that no other music by Carbonelli has come to the surface. What this disc has to offer is exciting stuff; the label Recording of the Month concerns both the music and the performance. I sincerely hope that Bojan Čičić will find the opportunity to record the remaining sonatas. Carbonelli definitely deserves it.